Give us a call to schedule - 916.991.3007. We are open Monday-Friday between 8:00a.m. and 5:00p.m. We are closed on Saturday and Sunday. Email us at info@obrienskennel.com and our staff will give you a call back to schedule your reservation. O'Brien's kennel will need a valid credit card to secure your reservation. All first time visitors must fill out a dog or cat guest form. Proof of vaccines for all pet guests (please provide prior to arrival). What vaccines are required and what type of documentation is needed? Dogs require DHLPP, Rabies and Bordetella. You must provide proof of vaccine from a licensed veterinarian. If your dog has never recieved a Bordetella vaccine, you must vaccinate your dog 10 days prior to boarding. This is for your dog's own protection and is necessary for proper disease management. Cats require FVRCP, Leukemia, Rabies and feline Bordetella is recommended. Call the office and cancel your reservation at least two days (we appreciate more advance notice) prior to your arrival. If the office is closed, you may leave a message on voicemail. Someone will phone you back to verify your cancellation. You may also cancel via email at info@obrienskennel.com. There will be a charge for two nights of lodging for failure to cancel a reservation in advance. Failure to cancel a reservation during holiday season may result in a $100 charge to your credit card on file. What is considered a holiday or peak season? Holiday and peak periods determined by O'Brien's kennel are defined below and may require an advance deposit of two-nights boarding. If you need to shorten your pets stay during peak season, we ask that you let us know as soon as possible. May I take a tour of the facility? Of course! Please schedule an appointment through the office. We would be happy to show you around during normal business hours. Do you require that pets be spayed and neutered? We do not have spay or neuter policies for dogs. However, please let us know if your female is in heat so that we may make special lodging arrangements for her so that other dogs will not be disturbed or she will not be uncomfortable. Feline guests are required to be spayed and neutered. If my pet becomes ill while at the kennel, what happens? If your pet is showing signs of illness, we will notify you straight away. If we are unable to reach you and your pet needs medical attention, we will transport your pet to our veterinarian at your expense. We will not accept a pet that is terminally ill, in obvious poor health and condition. Dogs and cats in advanced senior years are also questionable in most cases. If we discover fleas or other external parasites upon check-in, we will require that your pet be given a flea bath at owner/guardians expense. My pet needs to be given medications during his/her stay. 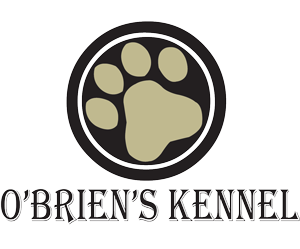 Does O'Brien's Kennel provide that service to my pet? The staff at O'Brien's kennel are not licensed medical veterinary doctors or technicians. However, we will administer oral medications via your veterinarian's instructions. A pet that requires medication is considered a "special needs pet". We cannot provide nursing duties that go beyond administering oral medications. May I bring my dog or cats bedding or toys? Yes. You may bring your dog or cats bedding. We also have cozy and clean blankets we will provide your pet. You may bring your pets favorite toy. Please do not bring something your pet will shred or chew. We recommend a Kong or Buster cube.